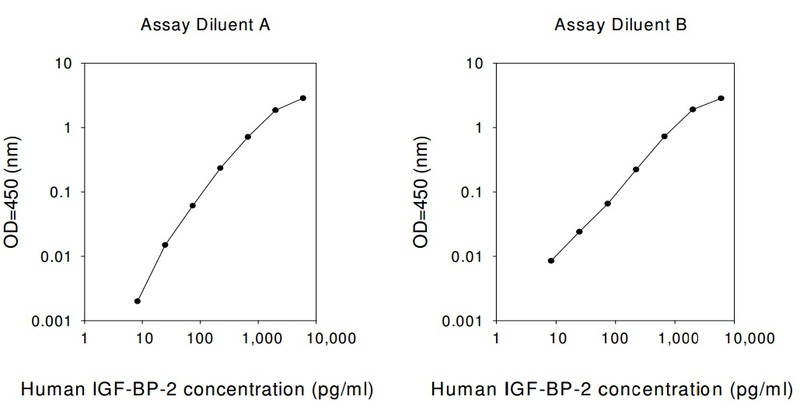 RayBio® Human IGFBP-2 ELISA Kit for cell culture supernatants, plasma, and serum samples. This ELISA kit shows no cross-reactivity with any of the cytokines tested: Human BDNF, BLC, ENA-78, FGF-4, IL-1 alpha, IL-1 beta, IL-2, IL-3, IL-4, IL-5, IL-7, IL-8, IL-9, IL-10, IL-11, IL-12 p70, IL-12 p40, IL-13, IL-15, I-309, IP-10, G-CSF, GM-CSF, IFN-gamma, IGFBP-1, IGFBP-3, IGFBP-4, Leptin (OB), MCP-1, MCP-2, MCP-3, MDC, MIP-1 alpha, MIP-1 beta, MIP-1 delta, PARC, PDGF, RANTES, SCF, TARC, TGF-beta, TIMP-1, TIMP-2, TNF-alpha, TNF-beta, TPO, VEGF. Chen-Plotkin AS, Unger TL, Gallagher MD, et al. TMEM106B, the risk gene for frontotemporal dementia, is regulated by the miRNA-132/212 cluster and affects progranulin pathways. The Journal of neuroscience? : the official journal of the Society for Neuroscience 2012;32(33):11213-11227. doi:10.1523/JNEUROSCI.0521-12.2012. Narayanan R., Fu B., Heald A., et al. IGFBP2 is a biomarker for predicting longitudinal deterioration in renal function in type 2 diabetes. Endocr Connect. 2012 Oct 24;1(2):95-102. doi: 10.1530/EC-12-0053. Dokmanovic, Milos, et al. "Trastuzumab regulates IGFBP-2 and IGFBP-3 to mediate growth inhibition: implications for the development of predictive biomarkers for trastuzumab resistance." Molecular cancer therapeutics 10.6 (2011): 917-928. Kühnl, Andrea, et al. "High expression of IGFBP2 is associated with chemoresistance in adult acute myeloid leukemia." Leukemia research 35.12 (2011): 1585-1590. Tombolan, Lucia, et al. "High IGFBP2 expression correlates with tumor severity in pediatric rhabdomyosarcoma." The American journal of pathology 179.5 (2011): 2611-2624. Pereira-Fantini PM, et al., Colostrum Supplementation Restores Insulin-like Growth Factor -1 Levels and Alters Muscle Morphology Following Massive Small Bowel Resection. JPEN J Parenter Enteral Nutr. 2008 May-Jun;32(3):266-75. doi: 10.1177/0148607108316197.